I've Got Val McDermid Covered! 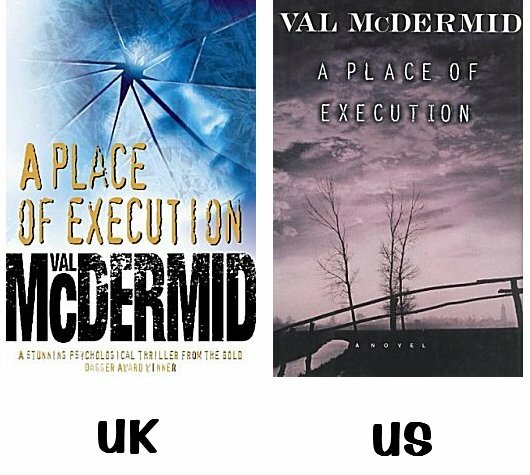 With Val McDermid being one of my favorite authors, you had to know that-- sooner or later-- I'd be looking to add one of her books to my comparison of US and UK book covers. And what better book for it to be than one of my all-time favorites, A Place of Execution? Few writers can emotionally poleax me, and that's exactly what McDermid did in that book. Several authors have since tried to copy her, but none have had the visceral power of those scenes that stay with me still, years after reading the book. Enough! 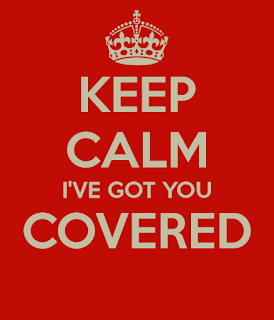 Let's get to those covers, shall we? Both covers are relatively simple. The UK cover is blue, white, gold, and black with the title, the author's name, and the information that the book is a "stunning psychological thriller from the Gold Dagger Award Winner." All the words stand out well against the background. The image of shattered glass is appropriate for this book. Lives have been shattered. But to tell you the truth, broken glass as a symbol on a book cover has been done to death, and I'm a bit tired of it. On the other hand, the US cover is dark and bleak, calling vividly to mind the setting of the book. For some strange reason, looking at it also reminds me of Truman Capote's In Cold Blood, although for the life of me I don't know why. That landscape makes me hesitate. I do not want to step foot in it. Something's wrong, and I don't know if I want to find out what it is. Which one do I prefer? I think I gave it away with my remarks on the UK cover. Although I like the colors, and the words stand out strong and clear, it's the US cover that draws me in-- and makes me want to pick up the book and open it. What about you folks? Which one do you prefer? The UK cover? The US cover? Neither one? Inquiring minds would love to know! (Inquiring minds would also love to know how many of you have read the book!) Feel free to leave your comments here, in an email-- kittlingbooks(at)gmail(dot)com, or on Facebook. I'm not crazy about either cover. One is clearly about lives cracking and one is gloomy, but one has no sense of why or what is going on. It could be any mystery as deaths happen in nearly all of them. I'd like to read this book. I keep meaning to read one of the outstanding books by McDermid. However, I saw the BBC movie on PBS and I know what happens, so it wouldn't be mysterious. Is it worth reading anyway? To be completely honest, Kathy, I'd like to say that you should read the book anyway, but you have the same problem as I: way too many books and way too little time. Since you have seen the BBC movie (I have, too), and it is a competent adaptation of the book, I'd say to give it a miss. By the way, I'm reading Entry Island and was enjoying my weekend reading about the islands in Canada and off Scotland's coast when work got in the way. I read your review and I'm not enjoying it as much as you did, but it is escapism for me and a book to get lost in. It is also leading me to read about the Isle of Lewis and the Madeleine (Magdalene) Islands. What a tough existence either way, but especially in the Hebrides before central heating, transportation and nearby medical centers! Yes indeed, Made even worse by the Clearances. I really like the US cover better as well, Cathy. It's more compelling somehow. As good a reason as any, I suppose. The edition I read had a completely different cover. Any other recommendations then for a McDermid book? I've had "A Darker Domain" on my TBR for a long time. Years ago, I read two by her but there were early books in series, not stand-alones. The first book that pops into my head is The Grave Tattoo, but unless you're interested in Fletcher Christian and the mutiny on the Bounty, you may not care for it as much as I did. I'll have to ponder this one a bit while I'm out doing errands. Mutiny on the Bounty, not so much. Omigod! The Clearances, what horror Peter May tells this historical truth well in fiction. And there was a potato famine in the Outer Hebrides, too. I'm into the reading now and will have to hide this book as I have work to do. The book is also sending me to find out more about these terrible Clearances. There is a tiny village in the remote NW corner of Scotland. I'll be spending a week there later this year. During the Clearances, the landowner's men purposely waited until all the village's men had left on their fishing boats before moving in to force the women and children out so their homes could be burnt. There were only two small problems. (1) The women got just enough notice of what was happening. (2) They didn't want to go. Due to the women's quick thinking and fierce resistance, no one was cleared from Durness that day. Because of what happened laws were actually passed to prevent landowners from conducting those brutal stealth clearances ever again. Right on! Bravo to the women resisters! Little-known history comes to light. I"ll have to read about this village's history. I like that Peter May tells of the women's resistance in the village that he's write about in the Outer Hebrides. They tried as hard as they could, but alas, they had stones and the landlords had sheriffs, guns, batons, chains. I'm very glad to hear that in Durness laws were passed to stop the landowners from carrying out those stealth clearances. The laws were passed for all of Scotland, not just for Durness. The women and children of Durness were very lucky. (1) They had just enough notice to grab scythes, pitchforks, and any guns that might have been handy, and (2) the landowner's men thought that-- after planning their arrival after all the men of the village had left in their fishing boats-- they would meet with little resistance from women and children. They thought wrong.